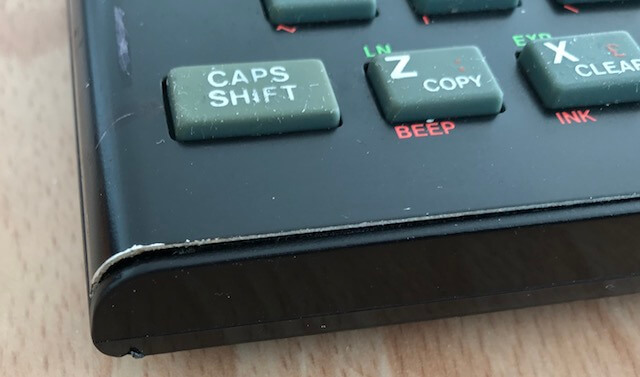 Usually when the keyboard on a ZX Spectrum has stopped working it is due to a membrane failure due to old age. No wonder since the connectors are very thin and is about 36 years old (assuming it still has the original membrane when it rolled out of the factory). So this might be a good starter project for me to get my hands dirty. Issues one, two and three are relative easy to fix, no soldering is required for these. The last two (five and six) will require some soldering and if I want to turn this unit into a 48K model a bunch of IC’s. 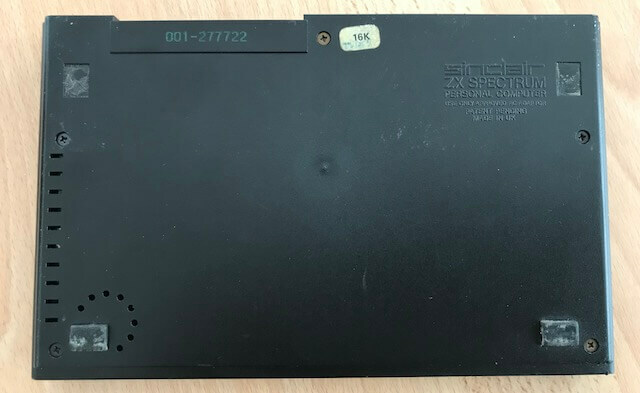 Opening the case off a ZX Spectrum is really simple, just remove 5 screws from the bottom of the case and you can carefully lift the top and disconnect the tabs of the keyboard membrane. As I suspected from peering into the extension port all the IC’s related to a memory upgrade from 16K to 48K are indeed present. One of the IC’s (IC26) looks a bit weirdly placed (see the right-hand outtake in the image above), but since the machine boots without any issues I will just leave it as it is now. Also appears I was correct in assuming the RF module had not been modified to output a composite signal (see the left-hand outtake in the above). The next part to inspect is the keyboard. Since the faceplate was already loose on both corners it was easy to remove it completely and take out the membrane. 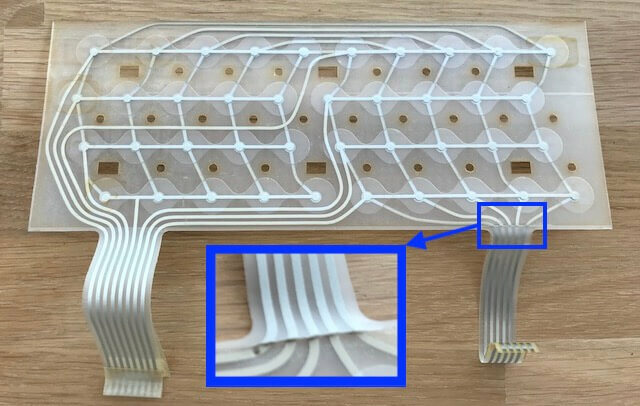 At first sight it looks fine, but taking a closer look indeed confirms the wiring has snapped. 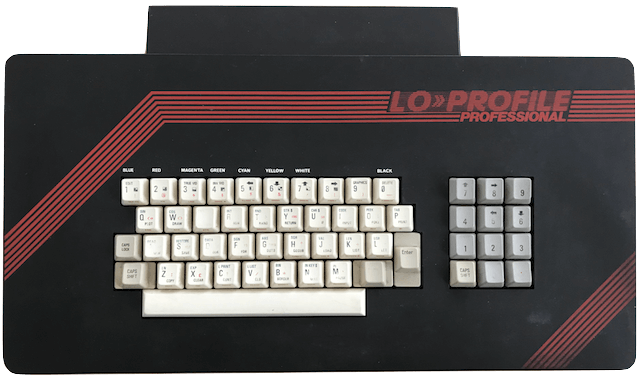 Next question to get answered is it actually an 48K model or 48K model with only 16K working. 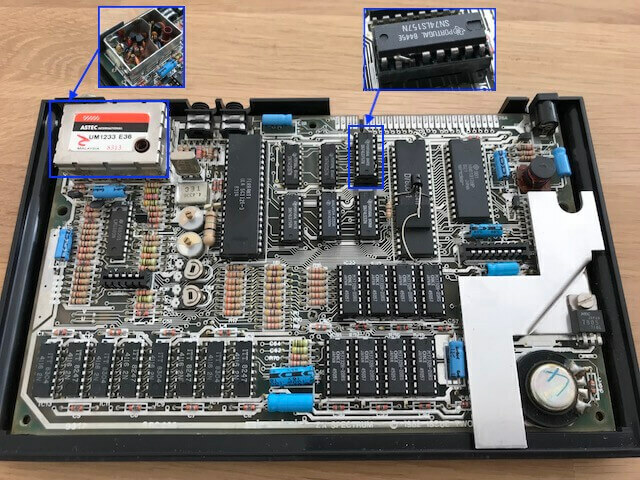 Today I received another broken ZX Spectrum (motherboard issue 3B) having video issues (probably the next project after this one), but has a working keyboard (LO profile). So easy job to hook its keyboard to the unit I am now diagnosing. Since the RF module has not yet been modified into an composite out, connected my ZX-HD HDMI interface (available at ByteDelight) to the extension port, so I can connect it to a modern TV or monitor. 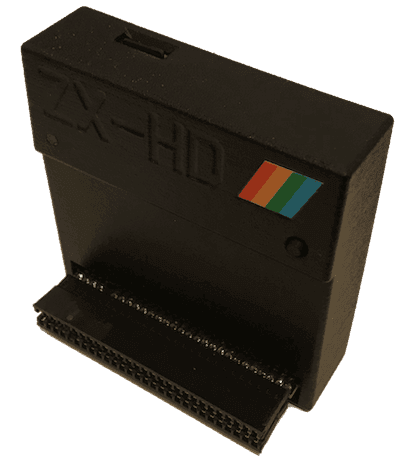 The ZX-HD HDMI interface also removes the need to modify your ZX Spectrum to be able to connect it to modern technology. Using the command PRINT PEEK 23733 you can quickly perform a test. In the case of this unit I got the number 255 as a result, which means it is indeed operating as a 48K model . This will save me some time and effort refurbishing this ZX Spectrum. I already ordered a new keyboard membrane and some rubber feet. I have not yet decided if I will replace the keyboard mat and faceplate.